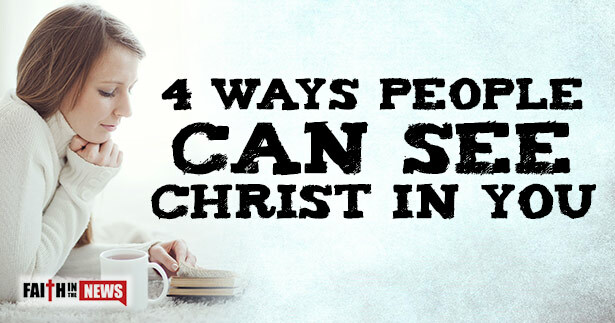 Here are four ways people can see Jesus Christ living in you. You might not notice, but people are listening to you. They hear the words you use with others and how you say them. For better or for worse, unbelievers will judge us or Christ in us by what we say to others, but also, what we say about others. If we’re gossips, then we’re not letting people see Christ, but if you try to believe the best in people and not jump to negative conclusions, people will see that you’re different from most. Let them hear words seasoned with salt, or more precisely, as the Apostle Paul wrote, “Let your speech always be gracious, seasoned with salt, so that you may know how you ought to answer each person” (Col 4:6). Even if you never get the chance to be heard by others, your actions can speak a lot louder than words. What you do is more important than what you say, because words are cheap; they come a dime a dozen. The hard part is doing, but when you do for others, you are telling people about Christ without using words. When we get the chance to do good, we should do it, as the Apostle John wrote, “if anyone has the world’s goods and sees his brother in need, yet closes his heart against him, how does God’s love abide in him” (1st John 3:17)? James writes that if you see a brother or sister in need but then do nothing (James 2:15), and you only say, “Go in peace, be warmed and filled,” without giving them the things needed for the body, what good is that” (James 2:16)? Jesus saw the hungry as Him being hungry (Matt 25:36), and by feeding the poor, you’re doing it to Him (Matt 25:40). I think loving others unconditionally would be like the mothers who never give up on their son in prison. They wrote them letters faithfully over the years and prayed every day for their sons. Their love is not based upon performance, obviously, so when you show love to others that few others would even show courtesy too, then they might see Jesus living in you. When you give regard to those who the world esteems less, then you show the love of God because His love is not based upon who a person or their performance, but upon Who Jesus is! Let people hear Christ in your words of grace; let others see Christ in doing good deeds; let other see Christ by helping them and those who have little; and by loving others in a way that doesn’t depend on who they are, but upon Who Jesus is. God is no respecter of persons (Job 34:19; Acts 10:34, 15:9; Rom 2:11), and neither should we be.